If you’re gearing up for increased business or have long production runs, a Gear Pump Preformer will provide you with continuous production capability for your preforming. 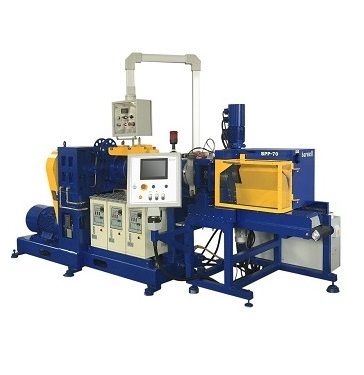 It will also reduce your machine set-up time and negate the need to pre-heat rubber on a two-roll mill, when compared to using ram preformer which is the preferred solution for batch production preforming. The Barwell Gear Pump Preformer is a fully automated and highly advanced screw extruder with integral gear pump specifically designed to provide high levels of control and processing flexibility for the continuous preforming or extrusion of almost any form of rubber compound. It combines three key elements, the plasticising properties of a cold feed screw extruder, the volumetric flow control properties of a gear pump and the proven Barwell cutter system.